By 1994, the mainstream circus around TMNT was gone. There were many reasons for the fall in popularity was both from the market changing and from poor handling. Since 1991, the ship had started steering unevenly. First of was the influx of an alarming number of anthropomorphic heroes in both comic books and television. Biker Mice from Mars, Street Sharks, Stone Protectors, all had come from the phenomena that TMNT had become. Mirage fans were upset in the massive setback in tone in the commercial product, and interest waning due to the lack of stability and creativity in the original comics which had now been dubbed Volume 2. The mainstream audience fought with similar issues, a cartoon show that began to show its paper thin concept as it progressed and a radical departure in the form of the Adventures comic book. Worst of all was the disastrous third live action movie released in 1993, which more or less sealed the coffin shut for TMNT. Kids had grown up over the last six years, but the TMNT had not grown with them. Tournament Fighters marked something of a last hurrah for the spotlight the four ninja brothers had enjoyed, ending the series' run on a high note, unfortunately not heard by most. A Game Boy version of Tournament Fighters was rumored to be planned in some magazines, though no proof has even come to light. The franchise did not sit still by any means, and desperately tried to regain some footing with the younger audience in a number of ways, and at the same time also focusing on the adult audience and their appetite for the return of the darker nature of the TMNT. With the cancellation of Volume 2, Eastman and Laird handed the series over to Savage Dragon author and creator Erik Larsen at his studio Image Comics, which at the time was one of the most popular comic book publishers with Spawn, Savage Dragon and Witchblade being among the titles they published. The comic book became known as Volume 3, and under Erik Larsen and Gary Carlson heads into a much more sinister, gritty and involved world than before, never shying away from bloodshed or gruesome consequences. It seemed to be exactly what the property needed to rejuvenate interest, but fans were divided on the approach. Volume 3 was not a stranger to including mutilation, cerebral murder and even romance which before was only done in careful doses. Some celebrated this as the return of the TMNT and them finally showing the ability to grow and learn as time went by, but the comic book's demographic also included many teens who had grown up only knowing the friendly cartoon, and the jump proved all too much for them to swallow. 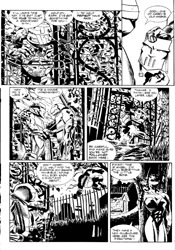 As a result, the comic ended on a cliffhanger on the 23rd issue, never to be resolved officially. In recent years, more and more have come to enjoy Volume 3 and expressing interest in seeing the timeline continued. Peter Laird himself removed Volume 3 from the official comic book canon due to him not being involved with it. In 1997, TMNT would see changes that would be universally reviled. Saban, who had brought the Sentai and Metal hero series concept over to the West with Mighty Morphin' Power Rangers, bought the rights to produce a new live action series. One of the very first pieces of information that would come out about this production, called Ninja Turtles: Next Mutation was the fact that there now would be a 5th female turtle, Venus de Milo. The idea of a female turtle had existed throughout every version of TMNT in existence, but was never approved by Peter Laird. Venus would be the perfect showcase of why the idea should never have been materialized. The series also confused viewers with its premise, sometimes claiming it was a direct continuation of the cartoon which had ended its run in 1996, other times the live action films, and lacking many characters from either, such as April. 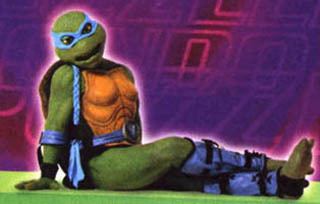 The show lasted only one season, and was quickly forgotten, and Venus banned from appearing in any future related TMNT merchandising. 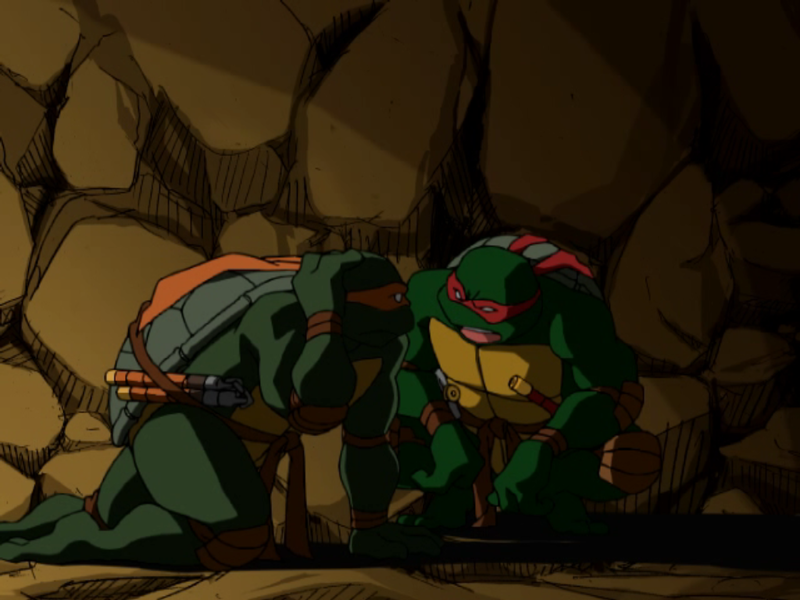 Next Mutation did manage to produce a first time crossover between the Power Rangers and the TMNT in the episode "Shell Shocked" in Power Rangers in Space aired in 1998. 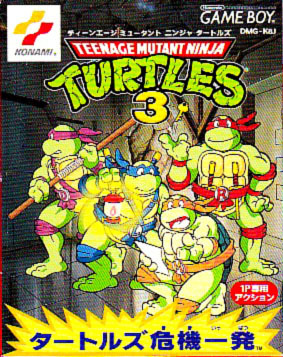 At one point in time, Playmates Interactive Entertainment announced plans of releasing what was set to be the very first TMNT game in 3D on the PlayStation. 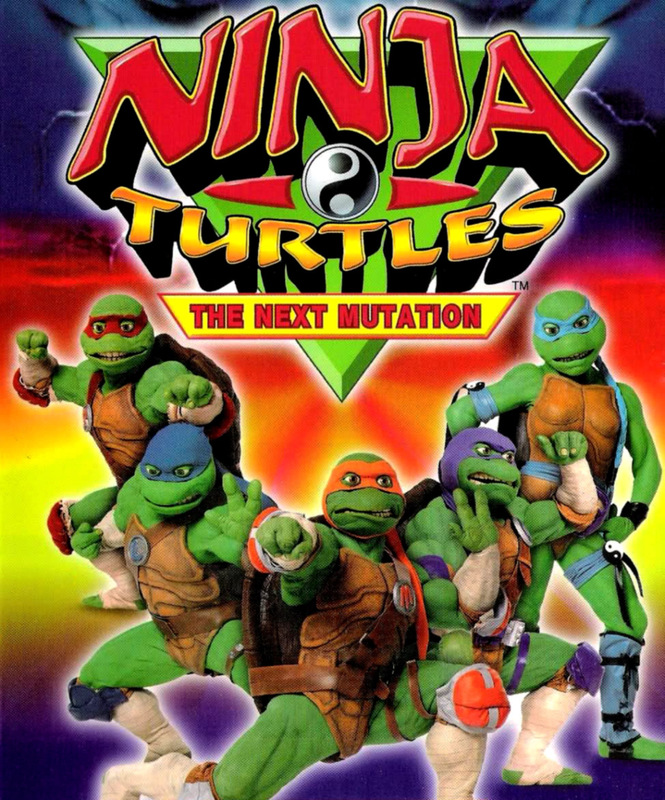 The early stages of development were reported throughout several issues of the PSM magazine in late '97 and early '98 eventually reporting that the game had gone from the name TMNT 3D to Ninja Turtles: Next Mutation, presumably to be based on the TV show. After numerous delays and missing its promised street date of third quarter 1998, the game was quietly cancelled due to the collapse of Playmates Interactive Entertainment. Rocker Games were reported to have picked up the license shortly thereafter, though it was since never heard of. No screenshots were ever released to the public. For the very first time since 1987, there were no Ninja Turtles to be found on television, and so the franchise sat out on an entire generation of the video game cycle, having no appearance on either PSX, Saturn or the Nintendo 64. A number of revivals were pitched to studio networks, including a 3D CGI test pilot, but it would take five years before the general public was ready to don their toy replica bandanas once more. 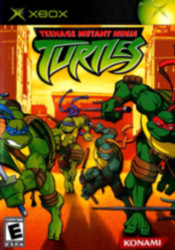 In 2003, TMNT was finally picked up again, this time by Fox and 4kids. The new series allowed for a fresh start, one that would see co-creator Peter Laird much more involved to provide for story and character background. 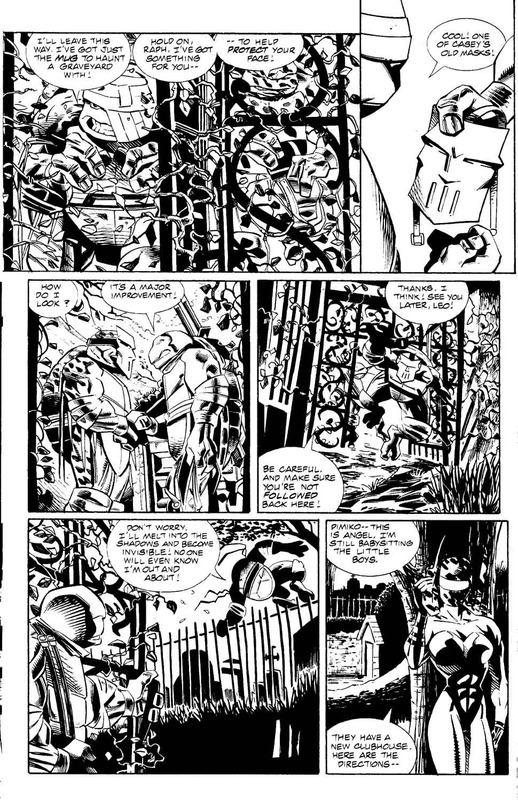 Going back to the origin stories found in the original comics, the TMNT 2k3 series took place mostly at night, in the dark alleys and sewers of New York City as they fight the organized crime syndicates plaguing the Big Apple. The wise cracking and goof balling from the 1987 cartoon was kept with a slightly toned down approach, as did the colored bandanas. Most of the cast in the 2k3 series were also kept strictly either from the Mirage comic book or originally created specifically for it, shunning away from the characters made for the 1987 show. 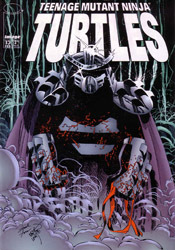 April is now seen by Baxter Stockman's side as an assistant, Casey Jones is featured more prominently and even Shredder himself is not all what he seems at first sight. The new show came closest to capturing both the mature and youthful sides of the TMNT so far and was met with approval by many longtime fans, though many who had only grown up with the 1987 cartoon were not as convinced. Not long after the debut of the show, the official video game was released onto store shelves. The new shows production team was eager to capture a lot of the magic of what made TMNT so alluring in the early 90s and rolled out the merchandising machines quickly, partnering up with most of the affiliates TMNT was associated with back in the glory days. Playmates produced a new set of action figures and playsets of high quality, and Konami were once again put to task of creating a brawler of turtle dimensions. TMNT 2k3 plays through the first season of the TV show in a extremely condensed version, and mixes it in with all new chapters not found in the series, acting as lost episodes, similar to what the Futurama video game did only one month prior to TMNT 2k3's release. Each level is accompanied with fully animated cutscenes taken straight from the show, though the new levels holds new animated scenes created exclusively for this game, and animated by an unspecified Japanese group. During the stages themselves, cutscenes are rendered with the in game engine, with the voice cast from the TV series reprising their respective roles. The TMNT 2k3 show did not see any of the voice actors from 1987 return. 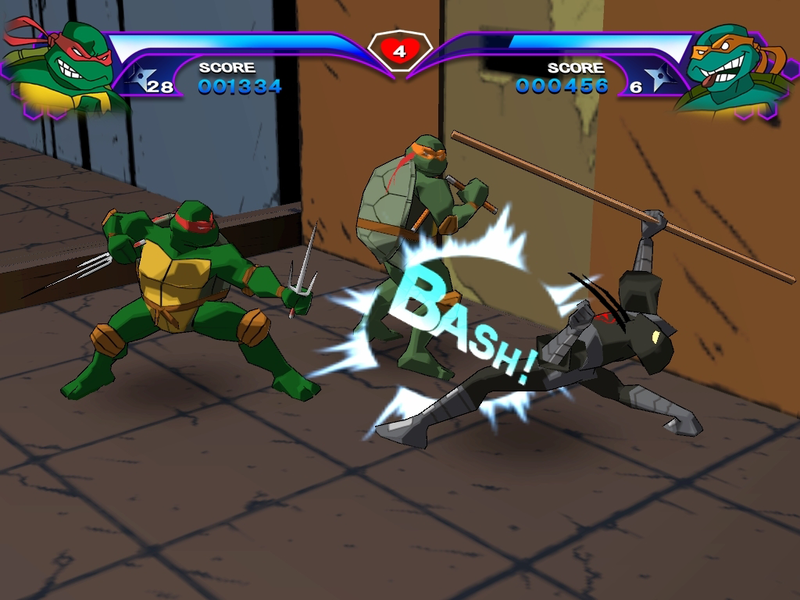 Based heavily on the arcade brawlers of the past, the game's layout takes the Turtles on linear paths through small 3D levels, divided into acts within each section, presented as an episode. 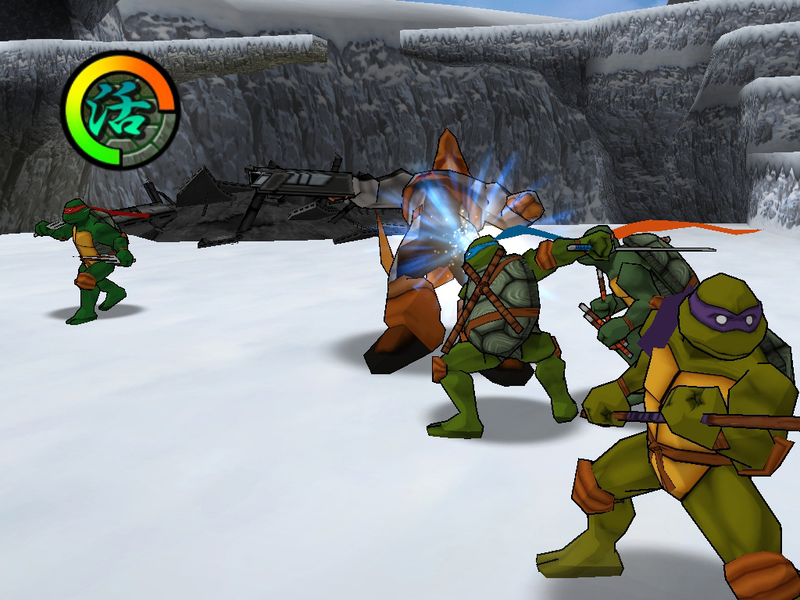 All four turtles are selectable, featuring different movesets as well as speed, range and rate that they lose health. Attacks are grouped into five different kinds - a shuriken attack, which throws a limited number of shurikens to stun an enemy, quick attack, swing attack, uppercut and regular attack. 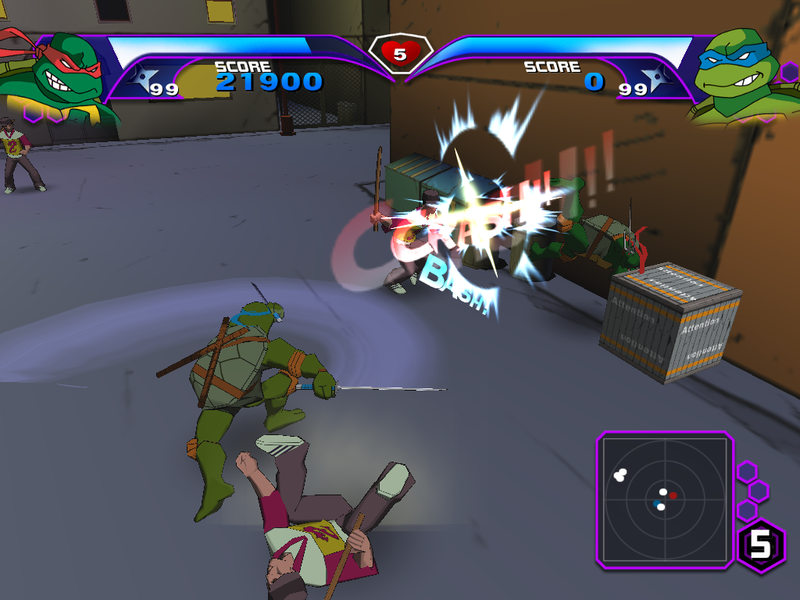 By combining the three striking attacks, a wealthy number of combos and finisher can be performed, with each turtle having their Turtles in Time special moves hidden within these combo combinations. New moves can be unlocked at Dojo stages, a training ground in the Turtle Lair where Splinter will give tasks for the chosen turtle to complete in order to be awarded the new skills. 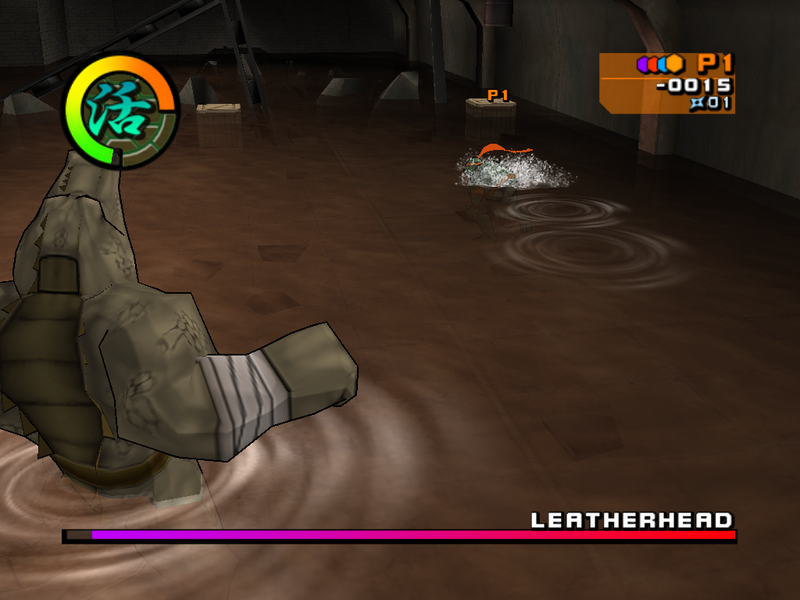 On each stage, crates and boxes can be destroyed to find numerous temporary power ups to help against the many enemies of the game, ranging from increased strength to improved speed along with the occasional healing item. There are also different kinds of shurikens to be found inside the crates, all having different qualities. 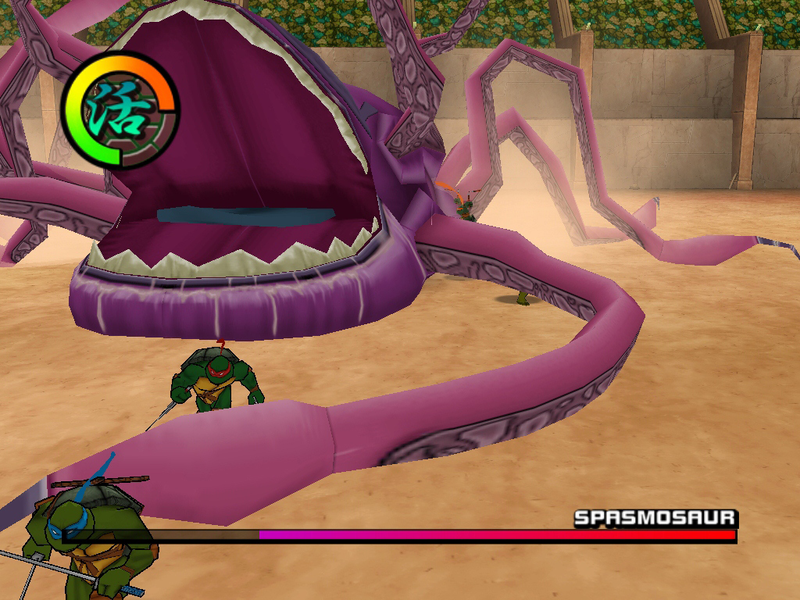 Each turtle also has a rage attack, the Gembu, which damages all foes on screen. The stages themselves in the Story Mode are built up identically to the way they were in the arcade games, though now with the added dimension, include more platforming elements as well as a bit of adventuring to find certain items scattered around. When enemies appear, the playfield is locked to a certain amount of estate forcing the player to duke it out and get rid of all enemies before being able to continue on. The combat is much more involved in its 3D transition, with enemies now going airborn and able to be juggled into combos, or throw into exploding barrels or cars to maximize damage. The number of enemies and their appearance is greatly improved, now ranging from Purple Dragon hoodlums, to Foot Soldiers and other mutated kinds. Making use of locations found in the episodes each stage is based on, the battle goes from rooftops to alleyways and research labs. The authenticity towards the show is quite well executed, splicing in clips from the show's episodes between stages to tell the story along with the in game dialogue which connects the liberties the game needs to take in order to work to bridge it all together. But what is more important is the two new stages made exclusively for the game. 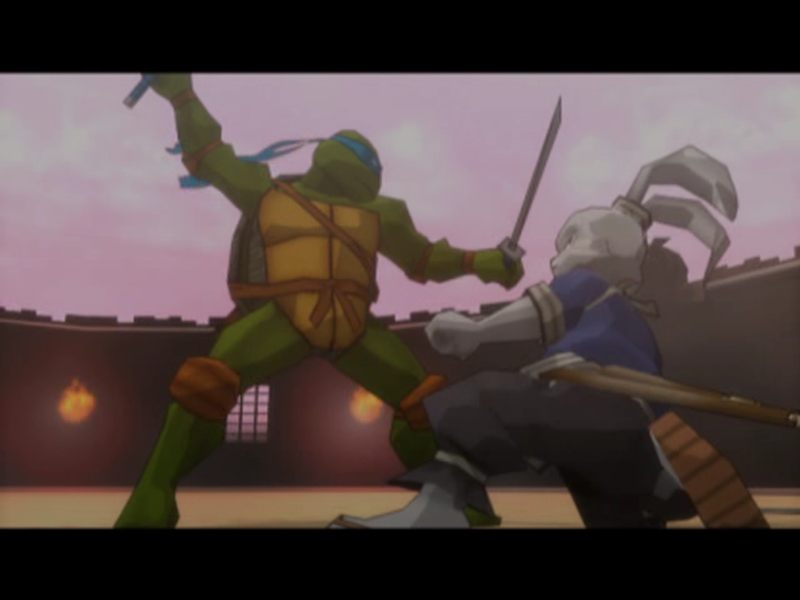 Featuring all new animated cutscenes (which are higher definition in the computer version compared to the low resolution videos taken from the show), the animation during these cutscenes are much better than the show itself, and holds more subtle details to the facial expressions and body language of the Ninja Turtles, as well as better told stories, going into more fantastique areas. 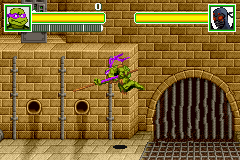 Maybe not surprisingly, one of the levels pits the turtles against a mecha version of themselves on a high chase through the city, while the other stage goes into an underground world, and shows the more gruesome sides to Shredder's organization. The reason why these new stages work so much better is due to the fact that the stages inspired by the episodes themselves exclude a lot of vital information on the intent and consequences of both parties' actions, merely bridging the fights together and focusing specifically on that. The Japanese designed scenes are more self contained, and have a better paced beginning and end which ties up the events much more effectively story wise. 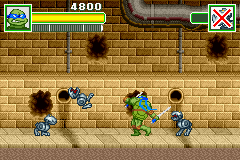 Some cutscenes are also affected according to which turtle is being used. There are also alternative play modes in addition to the Story Mode. 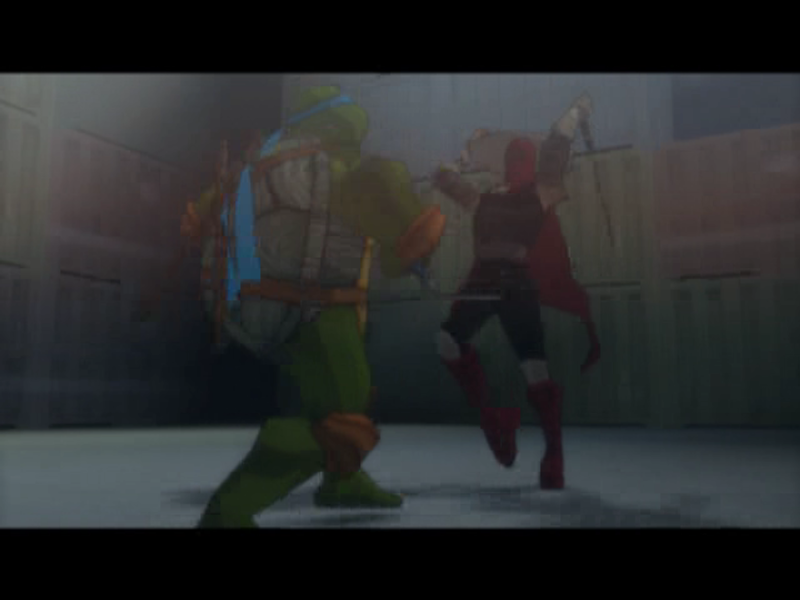 Two Player mode can be done for co-op throughout the campaign, and Challenge Mode is a sort of Boss Rush / 1-on-1 fighter mode which becomes unlocked after all Story Mode has been beat with all four turtles. Finishing the game unlocks a number of hidden secrets, including costumes, all of which are mentioned in the in game dialogue at some point. During the game as well, a number of secrets can be found. On each stage, Makimono scrolls can be found to unlock concept arts and 3D renders in the Gallery section, ranging from line sketches to 3D renders from the pitched 3D show several years back. Each individual turtle can find their color specific Makimono's and also branch out from the path to unlock new characters and areas for the Challenge mode. For the graphics, the cel-shading technique is employed to incredible results. Every corner and every particle to the game looks near identical to the cartoon show, with the characters blending in perfectly into their environments, which at times with a good positioned camera could almost fool the eye that it is a cartoon. Another high mark is the fact that the game runs on a constant 60fps, with incredibly smooth animations which can go on for quite some time with properly laid out combos, and each turtle behave and move very differently from each other. The only drawback is the actual faces of the four turtles, which up close look a bit crude, but mostly when seen from a far look acceptable. It doesn't fare as well in the audio department however. The soundtrack is entirely forgettable, and consists of rather faint technobeats based around the new theme song, which itself is not anywhere near as memorable as the old theme song from 1987, nor as easily arranged. All characters are voiced by their cartoon show voice over artists, and the lines are well performed, but the way they loop and repeat drives a man so insane, the only logical solution is to either completely block it out or end up in a fetal position begging it to stop. When released, the game was the subject of a rather bizarre mixed critical reception, ranging from average to terrible reviews, but with few being truly able to pinpoint specifically what made this game so much worse than the other games of the past or even current day comparisons. Some of the critique associated with the game rings true, the locations are a bit dull, locations sometimes drag while remaining restricted, it's an overall easy game and the audio as mentioned is far from preferable. But most critics choose to start out each review with a variation of "I am the biggest fan of TMNT, but..." and from there, spout the glory of the arcade game, but speak ill of this. 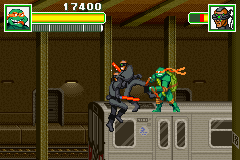 In games like Dynasty Warriors, the number of on screen enemies and intensity of the actual battles is much stronger than in Teenage Mutant Ninja Turtles, but as an evolution to the arcade brawler, it shows enough classic traits enjoyed from that era spliced with a much larger range of moves, narrative and replay value. Even though it was the first of the new 3D titles, it was clear even then that this was a transition title, which took one step from its predecessor into a new chapter, remaining recognizable for older fans while yet introducing the characters and the new setting to both familiar and unfamiliar audiences. 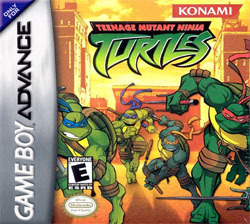 As much as most critics proclaimed their love for the TMNT franchise, most did not grasp the entire purpose of the game. The beat-em-up genre is one which had one of the toughest transitions into 3D, leaving a lot to be desired in order to live up the the stellar 2D brawlers from the arcades. It is by no means groundbreaking, but it's a solid brawler, one which retains a lot of what made the classic games fun, pick up and play learning curve, non stop actions and smooth multiplayer action. 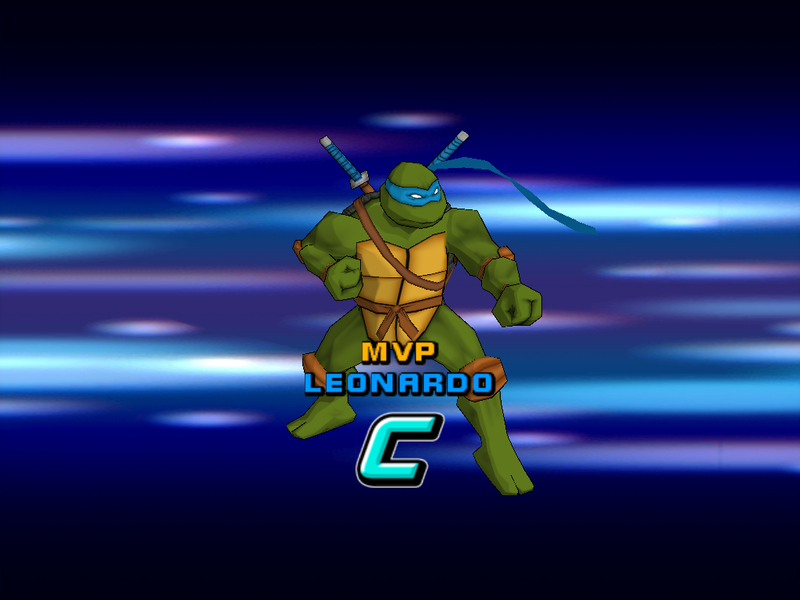 The stages might drag on in some cases, and the sound falls a bit flat, but with a friend willing to play, it's a good afternoon of easy fun, and with all the unlockables, the replay value is much stronger than in any other TMNT game before it. It leaves room for improvement, but it doesn't tamper with the fundamentals that work. The console versions released near simultaneously, except for the PC version which saw release one month after the consoles. There are no differences between these versions, though the PC allows for higher resolution than the other titles. None of the versions support four players. Across every version, the game will display seasonal changes if played on either Halloween or Christmas. A separate Game Boy Advance game was released at the same time as the console versions, deviating quite a bit from its console siblings. 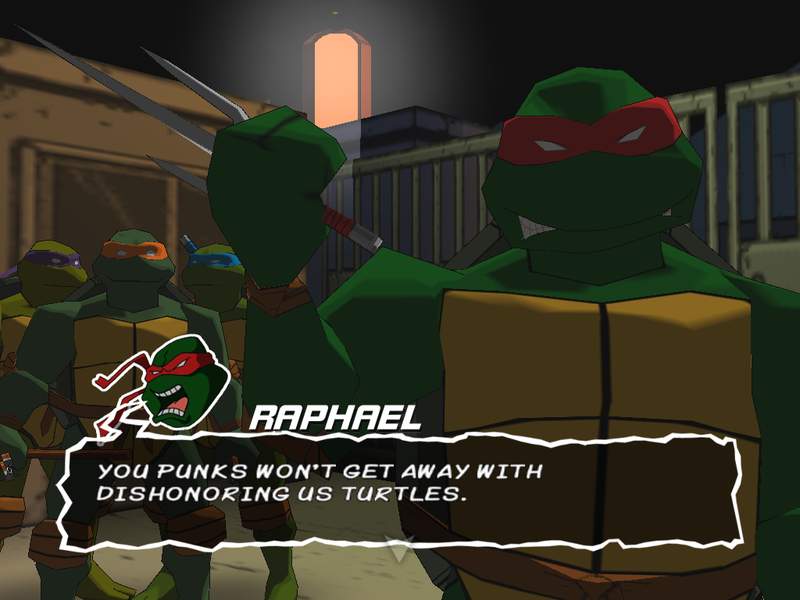 While the story's premise takes is somewhat influenced by the first season, the game uses a strange mix of original content a long with scenes from the series to tell a heavily abridged and modified storyline of how the TMNT and their new friends meet up. 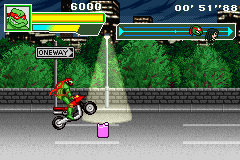 Unlike most TMNT games, the GBA game does not have a two player mode. Rather than relying too much on the past brawler set up, the GBA game is a 2D action adventure, blending the brawl with some platforming and timing. 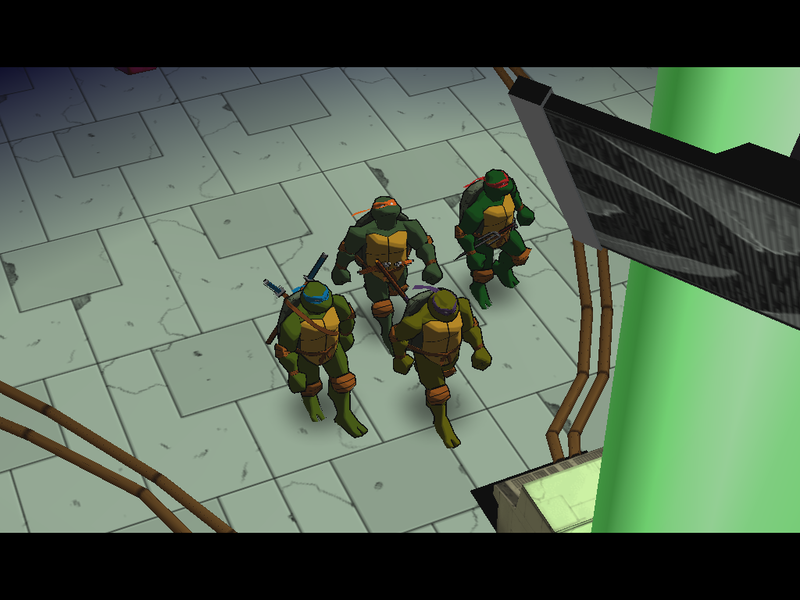 Each turtle has a set of five acts individually, all telling a different story from their perspective leading up to the bout against Shredder. 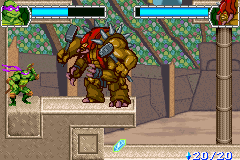 Individually, they have several moves, most of which derive from the combos done by repeatedly pressing the B button, but there is also a swing attack by holding down the R button, a special attack by pressing both A and B together at the price of some health and a charge move, which fills up a meter underneath the health bar which must be timed for power. 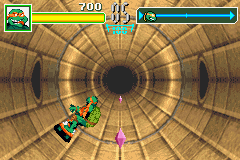 If the meter fills above the limit, the turtle will simply fall to the ground in exhaustion. In addition to this, there are also individual skills for each green brother which they make use of in their quest, with Mike having a Ninja Gaiden style wall jump or Leo being able to crawl through narrow spaces. Each provide some diversity between the four acts. 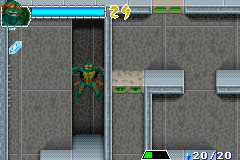 There is also one level per turtle which feature a special play mode, all of which resemble other famous games. 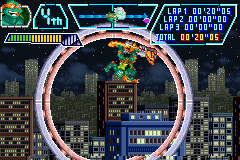 Leo has a StarBlade style shooter level against the mousers, Mike takes to his skateboard in what resembles the Sonic two bonus stages, Raph has an Excitebike race against Casey and Don takes to the sky in some Cho Aniki action. Well you could argue it's like any horizontal shooter but he has a white big beam coming out of his nozzle while phallic shapes fly towards him which leaves the comparison validated. Like the console counterpart, the graphics on this game is astonishing considering the system and looks great in motion with lush sprite work and animations, though the backgrounds remain fairly monotone throughout the entire experience, with the exception of the special stages. The soundtrack and SFX remains fairly low key and doesn't move out of its place, being completely in the background, mostly unnoticed. Despite the turtles having 1 act each to lengthen the game, it's still quite short, with each act lasting somewhere around 3-5 minutes each, and is generally a breeze clearing through. Apart from some more interacting levels, most of the game ends up on a straight path fighting some Foot Soldier, requiring little effort other than to push one button and wait till they walk into your barrage. All in all, it's a completely acceptable, middle of the road action game, helped by the fact it stars the TMNT to give it some visual appeal but held back by repetitive levels and no two player mode. 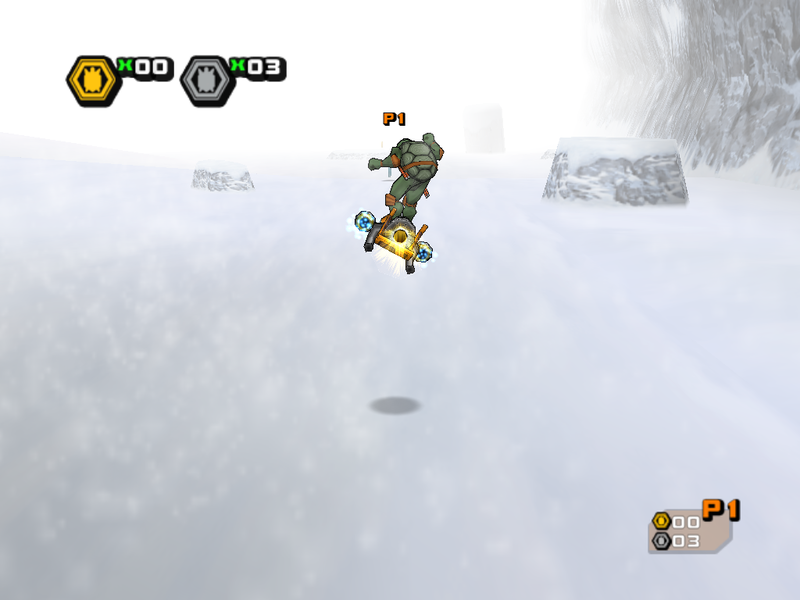 By completing the game and collecting crystals, codes can be unlocked for use on the GameCube version, such as alternative costumes and characters. 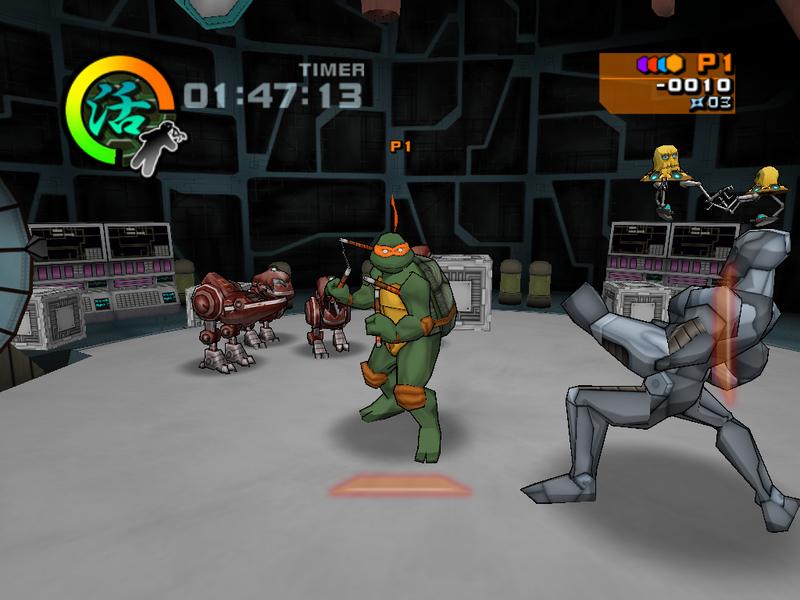 One year after the release of the reboot game series, the next chapter in the 3D brawler series was ready to hit the scene, promising to deliver more of everything that was seen in the first title, and also provide a truly innovative multiplayer experience worthy of the TMNT name. 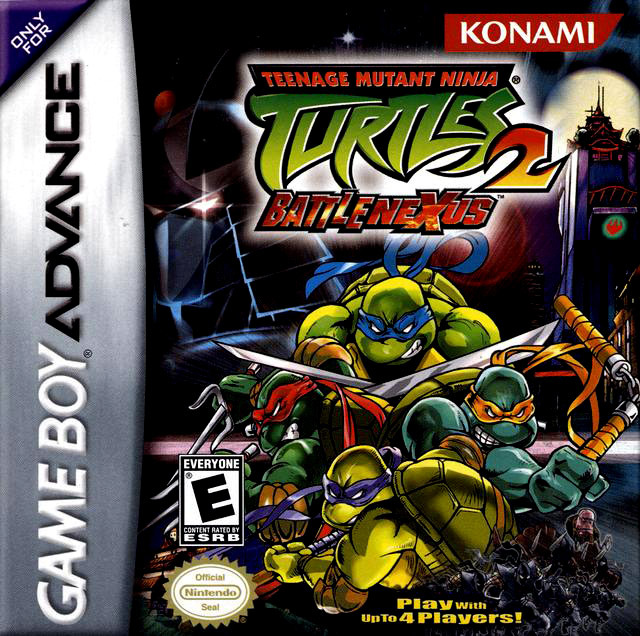 The premise of the game revolves around the Battle Nexus, a multiple-dimension-spanning tournament, a storyline which has appeared in many of the different TMNT iterations over the year. 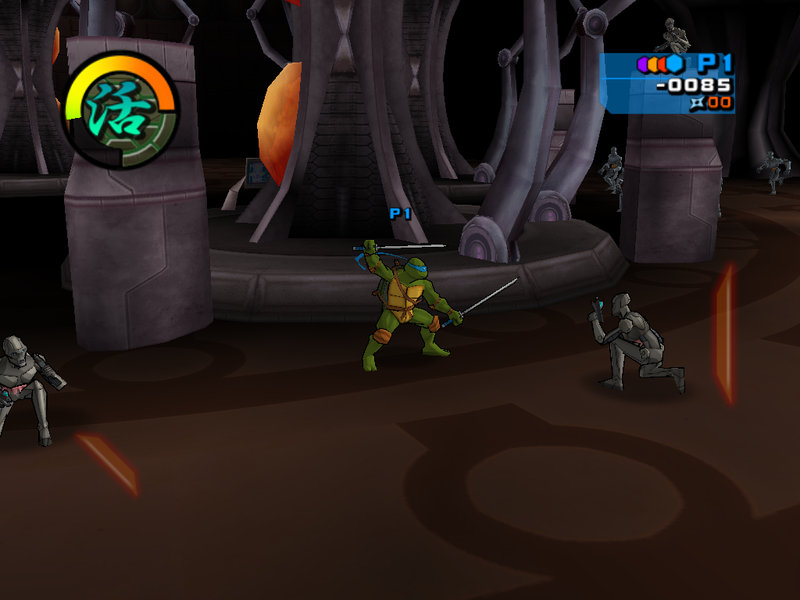 The big emphasis in Battle Nexus is co-op gameplay between all four turtles at the same time, a staple to the old arcade games but somewhat forgotten as years had gone by. 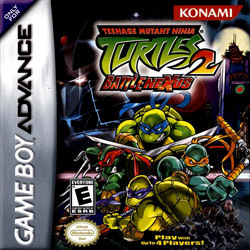 The major complaints over the prior title mostly revolved around the fact that, despite drawing a lot of inspiration from the classic arcade games, TMNT 2k3 only allowed for two players simultaneously. In Battle Nexus, the entire game bases itself on the idea that each of the brothers' individual skills to overcome all the obstacles presented along their path. 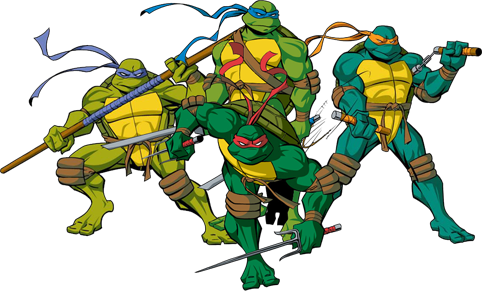 Leonardo's katanas can be used to cut bamboo to open new pathways, Mike can use his spinning nunchuks to glide through the air to cover great distances, Don can operate electronic equipment and Raph can push heavy obstacles out of the way. All these skills is in some way or another put into use through the 40-plus levels to pave the way and to uncover secrets. 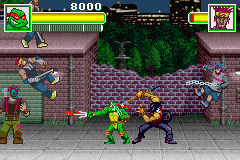 The single player or two player alternative allows for hot swapping on the fly to make use of all the turtles. Unlike its predecessor which took place over a set path divided into episodic levels, Battle Nexus now offers a map system with a central station hub that acts as the headquarters. Beating one level opens the next, and many levels have multiple paths which will open up new sections to the map and lead the adventure in a different direction. Each level is also given an animated prelude and aftermath which attempt to bridge the entire season's story and the exclusive new sections together to tell the very large arc of the Battle Nexus storyline. Each stage is constructed large in the same style as the previous game, being short interactive battlegrounds with some exploration for the secrets and pathways. New to Battle Nexus are the surfing levels, where the Ninja Turtles board either hovercrafts of space ships and blaze through territory at breakneck speed, picking up tokens and avoiding dangers, much in the style of the surfing stages found in Turtles in Time. At the end of each section of the map, which expands into time and space, there are also boss stages at the very end. The world map allows for some non-linear progression depending on which path is chosen to complete certain stages. Apart from the special skills, the characters themselves control differently. Initially the moveset is very limited, with their skills requiring some tuning and powerups in order to broaden further. Each turtle also have a very notable speed difference between each of them, and the timing required to trigger the combos changes. Due to the increase of navigation and platforming sections to the stages, a new double jump is also introduced, along with the possibility to lifting items or characters and throwing them. There is also an all new dash move that quickly stuns the opponent, and the charge move which acts as a Mana style charge special which inflicts great damage to any opponent. 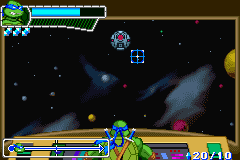 Each character has very different types of strikes and charge special, requiring some strategic selection to which turtle is sent into boss battles. The most important item to be found are the four crystals, each acting as both a temporary powerup during the stage and as an upgrade item that increases skills permanently. For the crystals, Blue is for infinite shurikens and capacity abilities, Red is for increased strength and additional moves and combos, Green is for defense and counter abilities and Orange is for instant charge and increased charge powers. After each stage the amount of items is tallied up and displayed on the ranking screen, and once a certain number has been reached, skills are upgraded with an explanation shown of how to execute the new skills. For stages such as the surfing levels, silver and golden tokens must be picked up to reach a high score in order to be awarded crystals. Each stage also holds a hidden artifact, which can be viewed in April's antique store to unlock further secrets, costumes and other pieces of trivia and interest. Each stage also serves a buffet of edible health refills such as pizzas and colored sugar drinks. 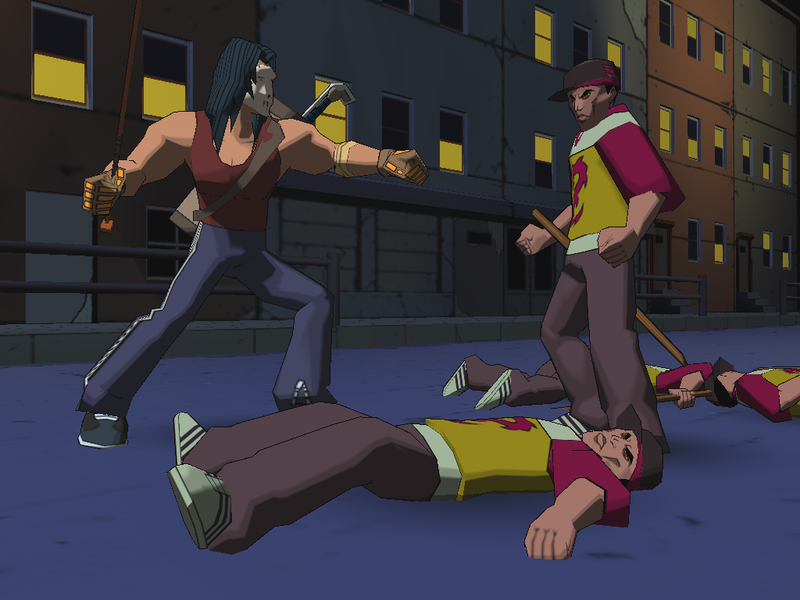 Graphically the game refines the cel shaded style even further to bring the game's aesthetics even closer to the look for the cartoon show, and the polygon count is increased for better anatomy and smoother shapes. Even up close, each character look incredible, even doing away with the crude sharpie style faces and adding some real nice detail and coloring the entire look, head to toe. Battle Nexus also sports a much improved enemy roster, bringing the Utroms, Triceratons, Foots, Purple Dragons and bio engineered mutants into the action to what is by far the largest cast of TMNT characters assembled in one single game. Battle Nexus also runs at a constant 60 frames per second, even during four player action. 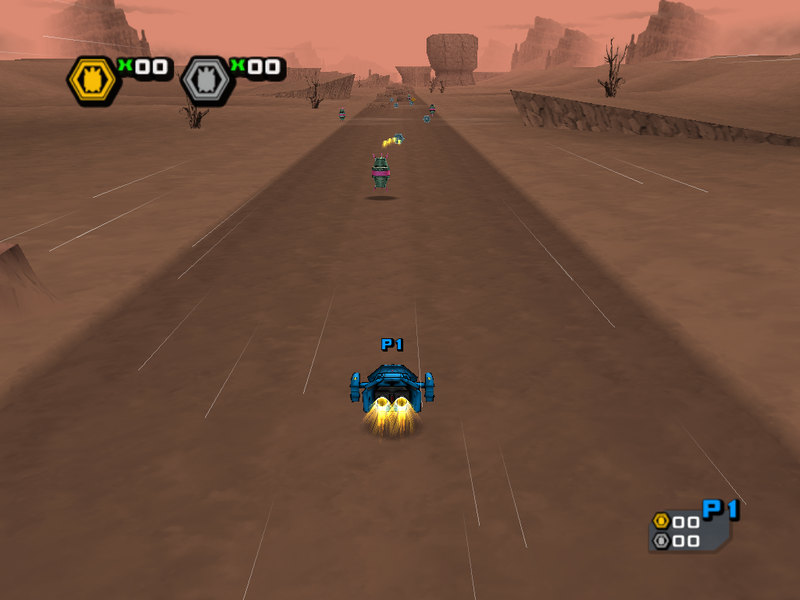 But beyond the graphical improvement, Battle Nexus hoverboards itself right off the cliff in a dramatic fashion. Very little else has been given the attention it needs, and the new features are all woefully thin and neglected. 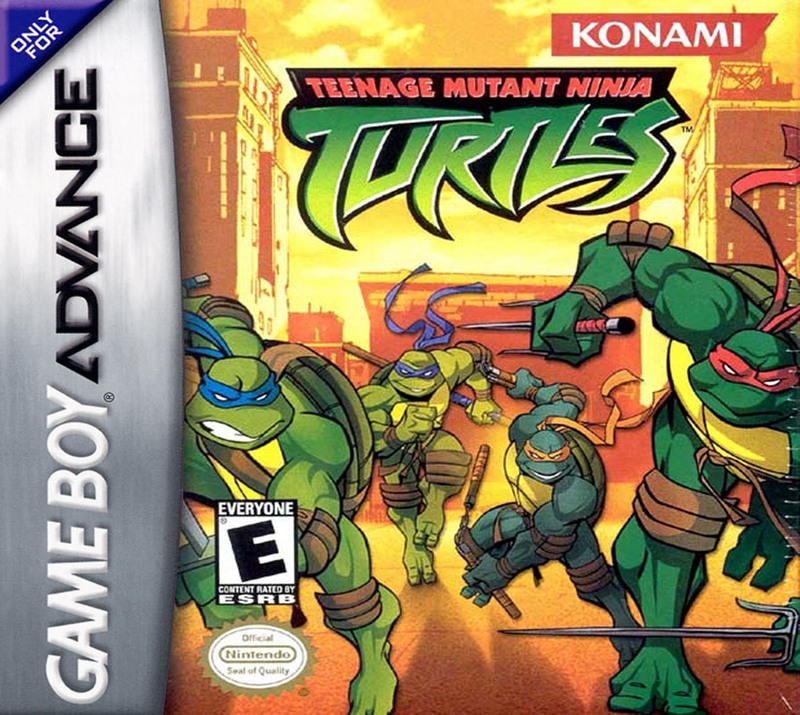 The game injects pure venom into the veins by falling short on nearly every single aspect in its gameplay, and the focus on multiplayer and variety in the Ninja Turtles actually ends up damaging the game to an alarming extent when it very much is the center point and main selling point which, as one can just imagine, makes quite a large impact on the overall experience. The stage design is what manages to break the multiplayer aspect entirely, not by chaotic mayhem or uncontrollable camera systems, but rather through complete indifference. Despite the wealthy number of levels, an impressive amount of zero levels actually makes use of any cooperation between the characters, and there are no teamup moves to be found whatsoever. In fact each level does make use of more platforming sections than the previous title, but these consists of making precise jumps to make it onto a moving platform or conveyer belts (and man does this game have more conveyer belts than Little Lisa's Recycle Plant), but this is hardly the form of adventuring that suits up to four players, which inevitably is going to come to include someone who just can't get the hang of the game and miss the jump over and over. 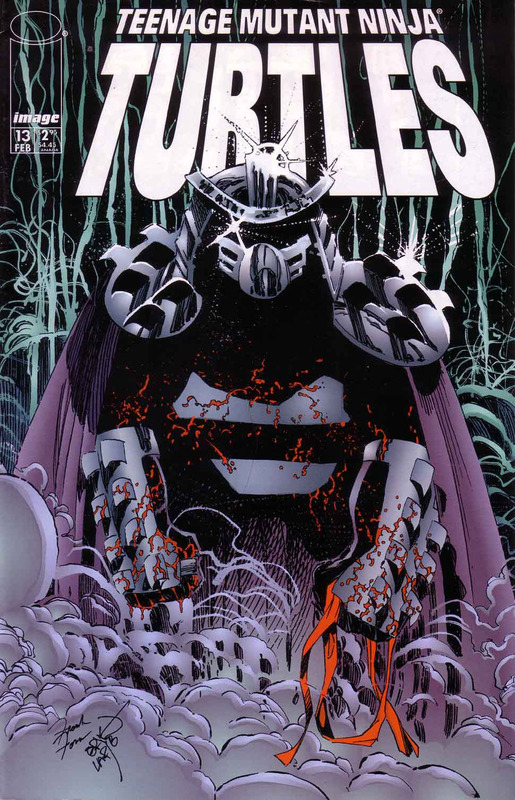 One might start thinking that this is fine because eventually that person is gonna run out of energy and the rest can continue on, but this turtle soup is spiced differently. You see, all characters share a life bar. Yes, if one player dies, everyone dies. The level design and the enemy AI, which admittedly was quite bland and lacking in the first game, takes a bare knuckle punch to the gut as well. While the first game made the limitations works better within its smaller framing and linear style, Battle Nexus presents itself as a large reaching adventure spanning galaxies and time periods, yet both the AI and the overall layout of each stage remains planted in its most primitive form. The game also seems to have been made in sequence, as it gets progressively worse and unlockable design sketches for the stages begin to show signs of being rushed to completion. Another glaring issue is the fact that each stage rarely lasts longer than 30-60 seconds, being just short intervals between the many cutscenes found in the game. Some stages actually feature a longer combined running time of cutscenes than combined length of gameplay, an issue most associated with Konami's blockbuster Metal Gear Solid. 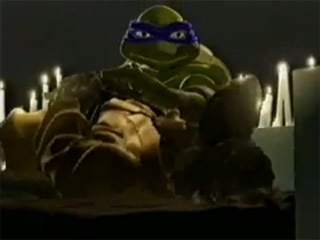 And though some of the cutscenes are fairly entertaining, they are inconsistent in presentation and animation style, with some being directly taken from the season two episodes, other animated exclusively for the game (albeit at a much lower quality than the first game) and also CGI cutscenes, none which blend very well and feature very different style of photography and pace. Not only do the cutscenes struggle with artistic consistency, they can also create a whole mess of continuity due to the fact that several stages has more than one path, leading to stages being done out of sequence, and therefore cutscenes being played out of order. Likewise, the new combo and battle system actually goes backwards. In giving each turtle a different feel and pace, requiring very particular timing, the individual movesets are brought down to about four different moves, unlockables included. To begin with, it might even feel as if the game is broken due to the choppy way the short combos abruptly ends, and it takes a good two quarters of the game in order to efficiently upgrade the arsenal to feel any substantial difference. 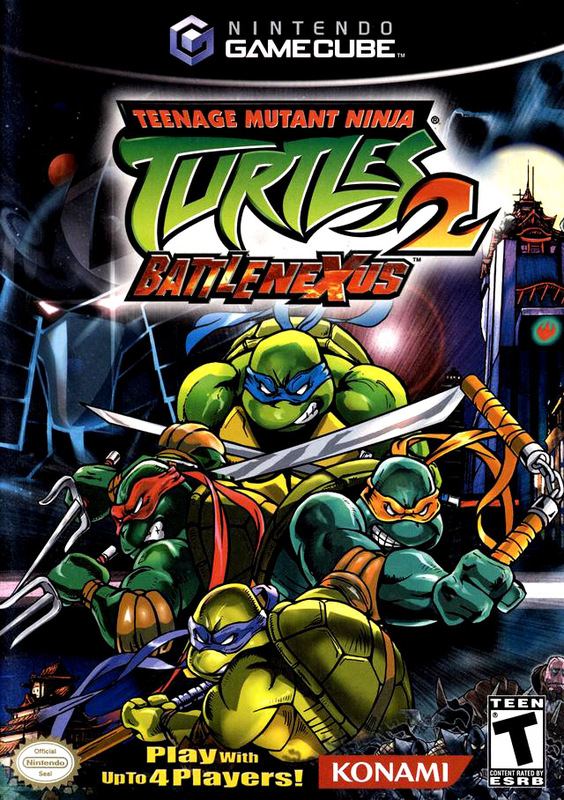 Worse yet is that Battle Nexus, in attempting to create some strategic elements to the battle system, gives the enemies a wider range of attack than the actual turtles themselves, stating that players needs to figure out the best course of action by choosing the right turtle for the job. A noble idea, though immediately disregarded due to the fact that none of the characters have a large enough list of commands to effectively fight fairly, leading to each battle basically becoming a single button mash to perform a corner trapping double hit combo until the foe is defeated. Even with the many bosses in the game, the only true strategy that works is to trap them in the corner and spam a single attack. One area that can't be faulted is the sheer amount of content packed into the game however. Each stage holds a plethora of unlockables, all which are presented with rich visual and descriptive representation. Anything from statues to characters and gadgets can be examined at April's store, and each item unlocking a piece of art or codes to input for powerups or other tools of aid for the Turtles. 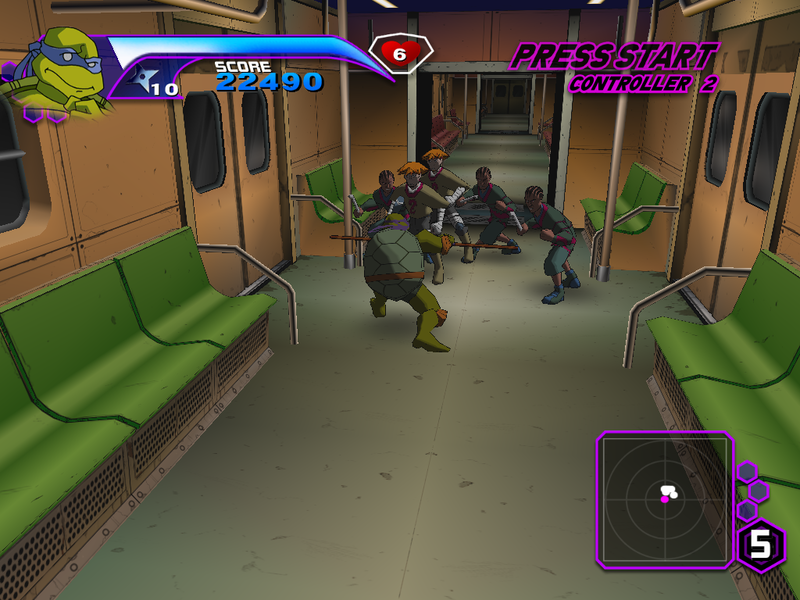 Familiar faces such as Splinter and Casey Jones can be unlocked as playable characters. In addition to costumes and characters, new gameplay modes can also be unlocked, namely the actual Battle Nexus mode. 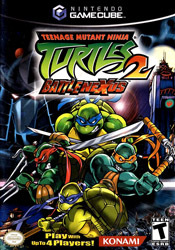 Serving as a gauntlet style survival mode, Battle Nexus allows for a 10 round back to back battle with several enemies and bosses to unlock new antiques and crystals which one turtle must endure, only awarded a selection of breakable crates between each round which may contain either shurikens or health refills. Perhaps Battle Nexus's greatest claim to fame can be said to be found in this mode. 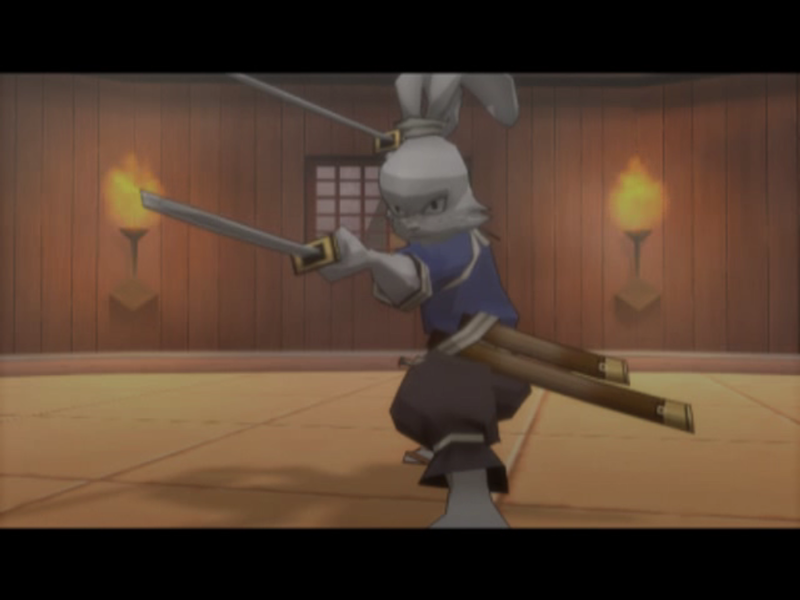 At the end of the tournament, Stan Sakai's iconic rabbit ronin, Usagi Yojimbo, makes a surprise cameo, appearing in a video game for the first time since 1988, and for the very first time in 3D. Sadly, Usagi does not appear as an unlockable character. But what Battle Nexus is ironically most remembered for is the ability to unlock The Arcade Game, the 1989 classic in all its arcade glory. As noted in earlier in this article, this port brings a number of changes, changing out the imagery and sounds taken from the 1987 cartoon with the new 2k3 version, and the soundtrack being a synthesized downscaled version of the Battle Nexus soundtrack. The fact that the game in its entirety is included is a pretty neat feature on behalf of Konami, and even with the changes made, it holds up remarkably well, much better than the game it is found within. Beyond the slick graphics and numerous unlockables, there is very little substance to be found, and the highly convoluted story only serves to overcomplicate a game that cannot even get comfortable with its simplistic outline. It wouldn't be so bad if the team simply focused more on actually making the game a multiplayer experience rather than adding multiplayer to a preexisting single player experience, and making no effort whatsoever to make use of their individual skills in any puzzle or obstacle. When released, the game was universally panned, and quite rightfully so, being to date the lowest rated TMNT game ever released. Despite this, the game sold exceptionally well due to the popularity of TMNT toy merchandising and the lure of the unlockable arcade game. 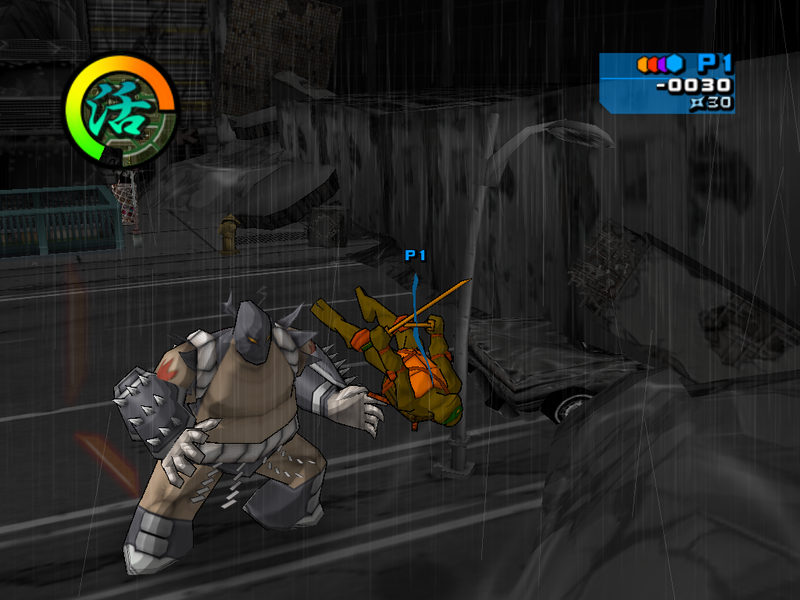 As with the first 3D game, Battle Nexus was released on all sixth generation consoles in identical versions, with the only difference being that the PlayStation 2 required a multitap in order to enjoy the full experience of The Arcade Game, and suffering from some framerate drops. The PC version seems to be a hasty port of the Xbox game, allowing for higher resolution, but surprisingly omitting the inclusion of the classic arcade game. The artifact itself can be found and inspected at April's shop, but doing this does not trigger the game to become unlockable as in the console version. A piece of often overlooked trivia about this game is the fact that during the battle with the Utroms, Battle Nexus actually takes place in the very same room depicted in Michael Dooney's cover for the fourth issue of TMNT, which was used as the cover for the NES game. 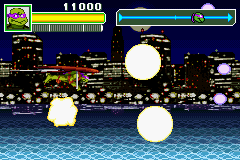 Unlike the console version, Battle Nexus on Game Boy Advance actually goes out of its way to deliver more of what made the first handheld outing as good as it was, and manages to impress in many areas. It was released in the same window of time as the console versions. 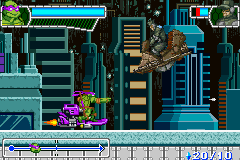 Sharing only the storyline based on the second season, the Game Boy Advance game focuses on 2D platforming action utilizing each brother with their individual skills going through three worlds consisting of six levels, splicing in several types of game with the returning horizontal shooter sections and crosshair laser shooting ranges. 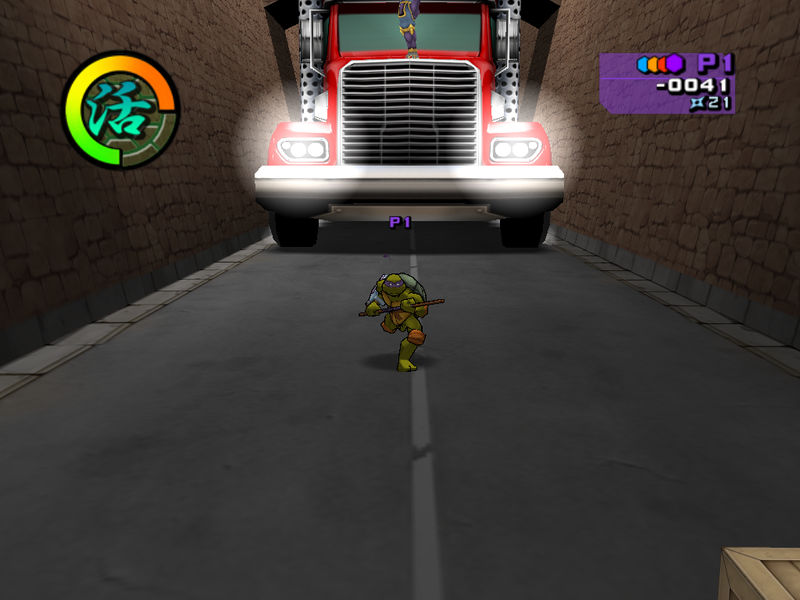 Each stage presents a small maze section, and begins with the turtle of choice out unarmed of their signature weapon, requiring the use of stealth and exploration to uncover its location. 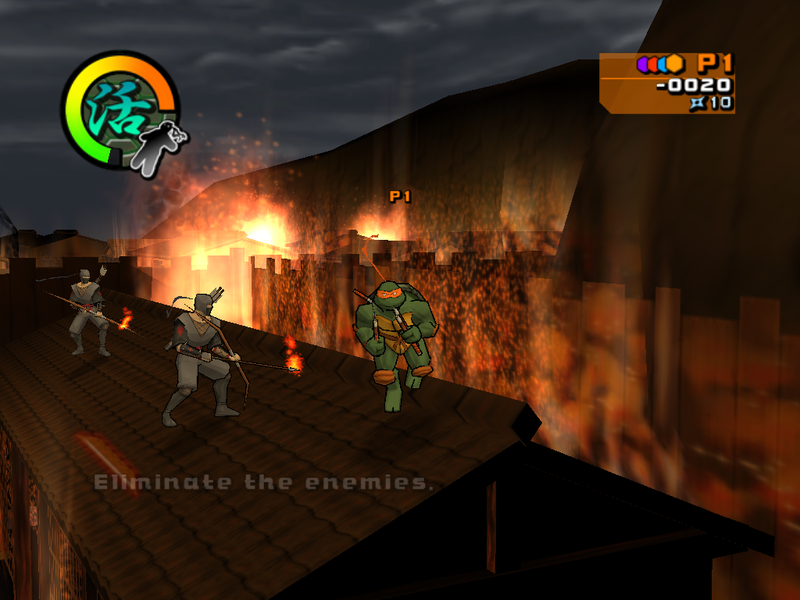 Battle Nexus is the first game that actually makes Ninja Turtles use their ninja skills, with the game taking some ques from Metal Gear by utilizing shadows and hidings spaces to avoid the enemies as they patrol the areas. 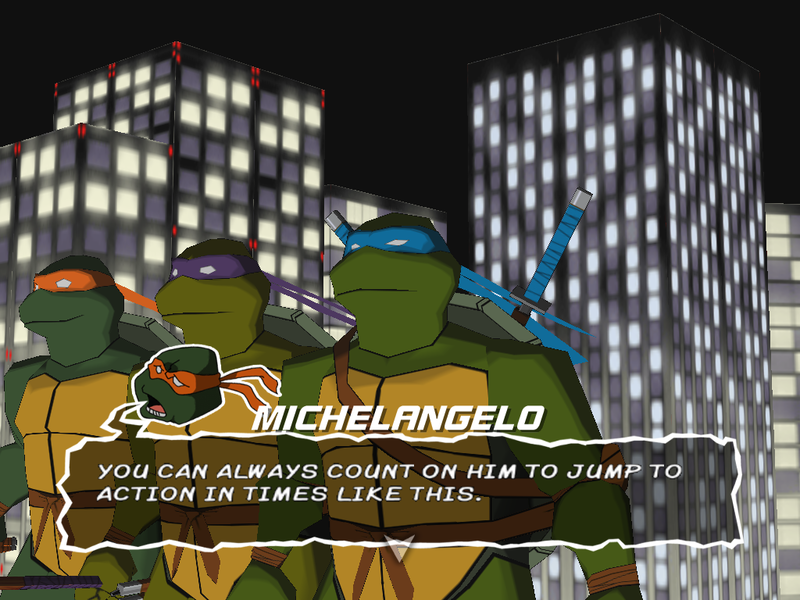 Once the weapon is retrieved, the turtles are able to go into combat better than ever, each with their own set of moves and special skills such as Raph climbing walls and Michelangelo once again hovering with his nunchuks. Each world has some rather extravagant boss battles, often filling more than half the screen and offering a different challenge from one boss to another. Each stage requires a mission to be completed, often in the form of collecting crystals or unlocking a door. Apart from the semi linear Story Mode, there are also the challenge based Battle mode, which features 18 different challenge that must be cleared within a short time limit, and allows for record and high score competition with other players. Race mode offers a good selection of stages where the Ninja Turtles race against eachother on hoverboards Sonic Rush style, going through futuristic rail based locations at blinding speeds, twisting and looping over walls and pitfalls. Completing these challenges or game also unlocks passwords for the console versions as well as the handheld game. It's somewhat surprising that Battle Nexus on Game Boy Advance manages to be such a polar opposite of its console sibling by actually improving upon its own concept and bringing in fresh ideas and fun varied gameplay. 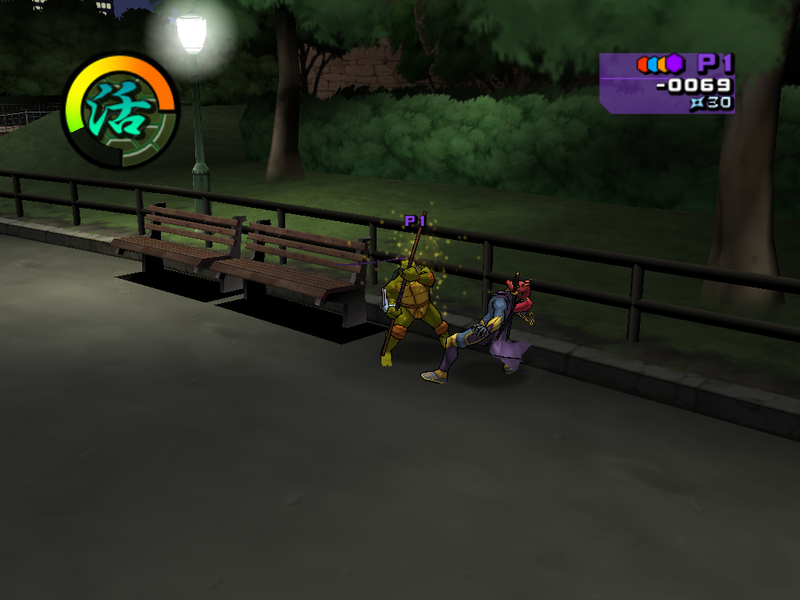 The graphics are gorgeous for its time and platform, and the colorful bosses and fluid animation only helps to make the second handheld title of the 2k3 lineup one of the stronger TMNT games released for both old and new fans to the franchise.